Vaginal birth after cesarean, or VBAC, is not a new phenomenon or fad. It became popular in the 1980’s after the American Congress of Obstetricians and Gynecologists (ACOG) issued statements promoting VBAC and dismantled the idea of “once a cesarean, always a cesarean.” The cesarean surgery has become so refined since its ancient beginnings that women are no longer dying during the operation and surgical technique has improved making VBAC a safe reality. In 1999, however, the VBAC movement was set back when ACOG released a practice bulletin limiting access to VBAC in response to legal concerns. VBAC labors were being mismanaged with an overuse of labor induction and augmentation drugs leading to an increase in uterine ruptures (UR) and therefore an increase in liability for providers. After the release, women faced issues with access to VBAC. The “immediately available” recommendation given by ACOG (having an OB and anesthesiologist immediately available to respond to UR) gave hospitals and providers reasons to deny women VBAC including not having 24/7 anesthesia and not being able to “labor sit” at the hospital while a VBAC mom was in active labor. Since then, the cesarean rate in the United States has rapidly increased (going from approximately 22% in 1999 to nearly 33% in 2011), and the VBAC rate has rapidly decreased. Florida’s 2011 cesarean rate was 38.1% and Lee County’s 2012 cesarean rate is about 36.6%. ACOG has since released a 2010 practice bulletin stating VBAC is safe and appropriate for most women, but undoing the 11 years of setbacks has not been easy. The history and the numbers are interesting, but what is holding women back from VBAC? First there is the lack of access, and second is how the public perceives VBAC. How does access to VBAC hold back birthing mothers? It seems like a simple question, considering every sane person has the right to refuse any surgery they do not want or need. However, despite the risk of UR being on par with the risk of cord prolapse or placental abruption in any average pregnancy, women who want a VBAC cannot go to any OB or midwife. They cannot go to any hospital with a Labor & Delivery unit. Many are urged to undergo repeat cesareans, and sign intimidating forms filled with legal jargon outlining the risk they are about to take. The risks involved with multiple cesareans rarely come up. Locally, we have a small handful of doctors who will attend VBAC in the hospital and a few midwives from other counties who will travel here to attend home birth after cesarean, or HBAC. We are lucky to have one hospital whose nursing staff has gone above and beyond to make most VBAC moms feel welcome. Some areas, elsewhere in the country, have no options, and mothers must travel hours to have a VBAC. There are two types of hospital VBAC bans, a ban and a de facto ban. A “ban” means that hospital policy has been written to ban VBAC (although, moms always have the right to refuse surgery). A “de facto ban” means hospital policy does not prevent VBAC, but none of the providers who deliver at that hospital attend planned VBACs. The rules and run around can be very frustrating and overwhelming for pregnant mothers. Some moms feel defeated before they even begin. 45% of women are interested in the option of VBAC, yet 57% cannot find a supportive care provider. 91% go on to have a repeat cesarean. The obstacles to having a VBAC color the public opinion of the safety of VBAC. Logic says if a doctor refuses to allow a woman to even attempt a trial of labor after a cesarean (TOLAC), and hospitals ban VBAC, it must be dangerous. Pregnancy is a time when women become public domain for others sharing opinions no one asked them for, and VBAC opens the door for some of the worst criticism. People are outraged anyone would take such a risk. Risks are often inflated and sometimes lies persistently make their rounds (i.e. VBACs are illegal or most women fail). However, the facts don’t support the hysteria, not even a little bit. The risk of uterine rupture is actually quite low (0.4-0.6% after one cesarean) and the more vaginal births a mom has, the lower the risks. It cannot be illegal to have a baby vaginally and 75% of women who attempt a TOLAC have a VBAC. Conversely, no one discusses the serious and increasing risks multiple cesareans bring to subsequent pregnancies and births (placenta problems, hemorrhaging, ICU admissions, and scalpel injuries to the surrounding organs or even the baby, etc.). The truth is, for many women, having a VBAC is just what ACOG says: safe and reasonable. You are not crazy for wanting a VBAC! Locally we have options. The options are limited, but they are there. More importantly, there is support available for women who are pregnant and looking to avoid a cesarean. 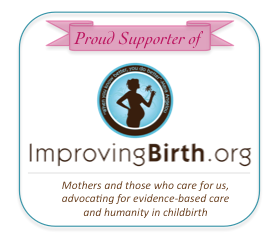 The International Cesarean Awareness Network’s (ICAN’s) mission statement is “to improve maternal-child health by preventing unnecessary cesareans through education, providing support for cesarean recovery, and promoting vaginal birth after cesarean (VBAC).” We are here to help you find a supportive provider, help point you to resources to research the risks and benefits for yourself, and to support you, no matter what you choose. We do not refute that the cesarean surgery is an amazing, lifesaving technology when used properly. If you have recently had a cesarean and are looking for options or support, please consider us at ICAN of Lee County. Megan Nickel-Martin has been the chapter leader for ICAN of Lee County since 2012. Find us on Facebook at facebook.com/ICANofSWFL.